It is built on power-efficient 10nm process technology based on new Kryo 360 architecture, built on ARM Cortex technology, same as the 710. 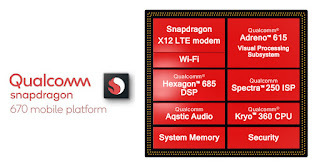 This uses 3rd generation AI Engine, promising up to 1.8x AI performance improvements in AI applications, up to a 15% improved CPU performance and up to 25% faster graphics performance with new Adreno 615 GPU, compared to the Snapdragon 660. It comes with new 14-bit Qualcomm Spectra 250 ISP for improved low light photography, noise reduction, fast autofocus, image stabilization and more. It also supports Ultra HD Video Capture, a feature that uses up to 30 percent less power than its predecessor. 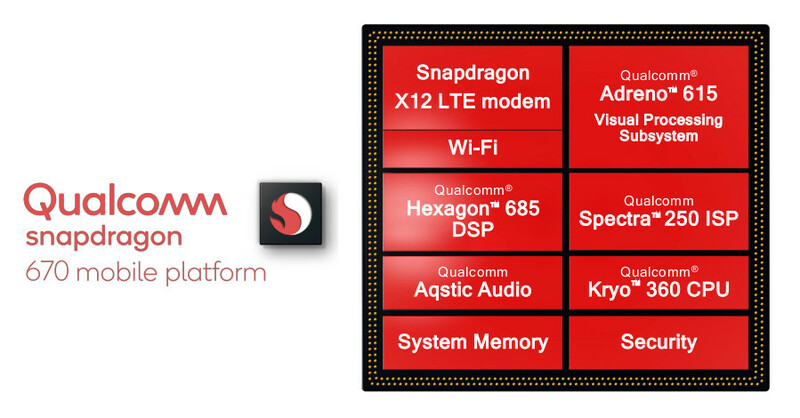 Snapdragon 670 Mobile Platform is currently available for OEMs expected in mobile devices in the third quarter (Q3) of 2018.